Keyboard shortcuts are a tremendous timesaver when working within particular applications, since I work in Final Cut Pro X daily, keyboard shortcuts are a major part of my editing workflow. I also use quite a few other applications that also use keyboard shortcuts, sometimes remembering all those keyboard shortcuts is difficult because there are so many shortcut keys to remember. Having a visual reminder of which key performs whichever action is super helpful — insert the Editors Keys backlit keyboard for Final Cut Pro X. In this review I am going to tell you about some of the design features of this keyboard and the user-experience of the keyboard itself. 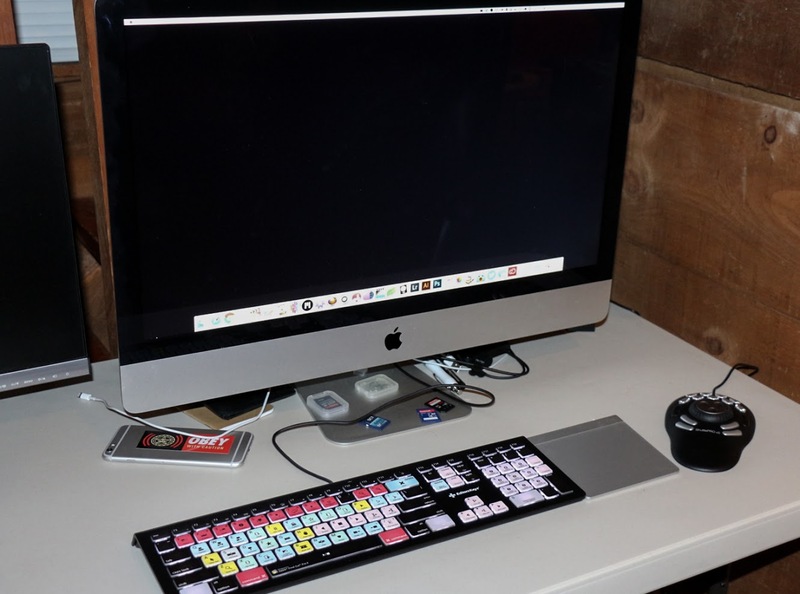 The Editor Keys backlit keyboard for Final Cut Pro X is a black, chiclet style keyboard. This particular keyboard includes the numeric keypad on the right side for a total of 109 keys, this keyboard also include F1 - F19 keys across the top of the keyboard. The keyboard is about the same exact height as my Apple wireless keyboard that came with my iMac, but this keyboard is more flat, which is ergonomically better than the raised rear / lowered front of the Apple wireless keyboard. It feels much more comfortable to type on, in my opinion. The actual keys themselves have more of a click-y sound to them, not too click-y but just a tad more than the Apple wireless keyboard. The backlights of the keyboard have four settings; low, medium, high, and off. One of my favorite aspects of the Editors Keys backlit keyboard is that it has four regular sized arrow keys, versus the half-keys on the Apple wireless keyboard. This is a wired keyboard, so it does use one of the precious USB slots on my iMac, but it is not a deal breaker, I usually have one empty slot open at all times anyhow. The lights are bright enough to clearly see which keys are for whichever shortcuts. Each key is clearly labeled with the corresponding shortcut for each key. Each label is easy to read either in a well-lit room or a darkened room since the keyboard is backlit. The keys are color coordinated to designate which group they belong to; such as the yellow keys, those are your Tools keys: trim, blade, select, hand, etc. Overall it is an extremely well designed keyboard, made of very high quality materials. Even the packaging of this keyboard was really nice. It was very Apple-esque, which is the gold standard of product design and packaging. I have been using this keyboard nonstop for three days now and probably my favorite key on this keyboard is the Power Button, yes a power button. I can actually turn off my iMac by holding down a button on my keyboard versus having to remember even more keyboard shortcuts and reaching for my mouse, it is like I am using my MacBook and not my iMac. I know, magical right? I can also put my iMac to sleep or even restart it if I do not want to completely turn my iMac off. All the keys works just as they do on my Apple wireless keyboard, I still have access to the the brightness of my iMac, it is still the F1 and F2 keys. F3 still shows me all my open apps. F7-F9 still allows me to control media in iTunes. F10-F12 still allows me to adjust the volume of my machine. The point I am trying to make is I do not lose any functionality while using this keyboard. It is designed for a Mac. It works right of the box — Editors Keys does suggest to download their Mac app so you don’t lose any functionality you might use that isn’t supported out of the box, but for me it worked flawlessly. The only thing that was different and I didn’t grasp on how to use out of the box was the brightness of the backlights. I haven’t used this keyboard before so the layout is different from what I am used to using, not much different, but a tad. The FN key is on the right side of the keyboard, next to the Delete key. I am used to the FN key being on my lower left, next to the Control key. So to adjust the brightness you hold the FN key and use the Page Up or Page Down key. There is also an Off button for the backlights, simply press the F6 key. The only issues I noticed were for the two Control keys, both the left and right side. The gray Control key sort of blends in with the word Control, making it a tad hard to read. I don’t consider this an issue, but it is just something I noticed. The Control keys are gray in color and the lettering is in white, there are other gray keys but the lettering on those keys are in black — in my opinion it would have been better if Control would have been written in black as well. The Control key is the only key I noticed this happening with. Also, on the Control key, the up arrowhead (⌃) is missing. I don’t consider that an issue either, but I know some Apple nerds may not like that. Using this in Final Cut Pro X is so much better than using my Apple wireless keyboard, not only for the shortcut reminders or having more keys at my disposal, but also for the keyboard being backlit, which means working in the dark is now more easier than ever. You are also able to re-map the keyboard using the Editors Keys keyboard application, as an example if you want to build additional shortcuts into the numeric keypad instead of the default ‘Apply Keyword Tag’ you have that option as well. I have not yet re-mapped the numeric keypad, but that is something that I plan on doing in the near future. With that said, I cannot comment on how well that works, but I just wanted to mention that the option was there. The Editors Keys backlit keyboard for Final Cut Pro X is an excellent keyboard and is a keyboard I would highly recommend to anyone looking for an editing keyboard to work with for Final Cut Pro X. Editors Keys motto is “Helping you edit faster” and I can honestly say that the statement holds true. Once you get into the habit of using shortcuts you will see a huge difference in your efficiency with your editing workflow. I would also like to mention, even if you are a seasoned veteran at editing in Final Cut Pro X, the shortcut reminders can be super helpful. Also, the fact that this keyboard is backlit, which helps reduce eye strain, that is a huge win. The Editors Keys keyboard feels very similar to an Apple wireless keyboard, so if you are used to that then the transition will be very smooth. This is a no-brainer, The Editors Keys backlit keyboard is a keyboard you should consider adding to your arsenal for your editing pleasure. I feel this keyboard not only helps train you into remembering which keys activate whichever particular shortcut, but I feel it also helps get you into the habit of actually using them, if you’re not already doing so. The EditorsKeys backlit keyboard for Final Cut Pro X retails for $129.99. For more information or to purchase this keyboard, please visit the Editors Keys website; https://www.editorskeys.com/products/video-editing-keyboards/final-cut-pro-x-backlit-keyboard/. I also wanted to mention that Editors Keys also offers video editing keyboards for Adobe Premiere, Avid Media Composer, DaVinci Resolve, Final Cut Pro 7, Sony Vegas, and Quantel. They also offer keyboards for audio editing as well as graphic and design keyboards for applications like Photoshop and Illustrator. 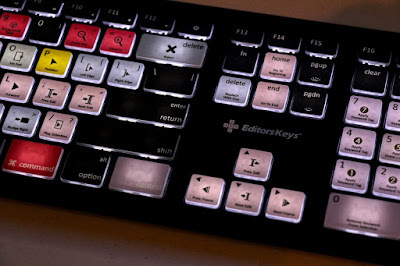 For more information about Editors Keys or to check out their other products, please visit their website; https://www.editorskeys.com/.